Your cocker spaniel's long fur can tangle and mat if you don't maintain a brushing regimen. Grooming is part of the deal when you take on a cocker spaniel. Cocker spaniels are notoriously active, and their long coats can quickly get out of control if you neglect performing regular maintenance. Grooming a squirmy, wiggly dog like a cocker spaniel can take a little more effort than grooming a less-hyper breed, but with patience and basic training you should manage to keep your dog's coat looking presentable and healthy. Make grooming a regular part of your weekly or daily routine rather than a massive project that takes place every couple of months. By taking your cocker spaniel's short attention span into account, you'll make grooming more pleasant for everyone. A hyper dog is more likely to stand still for five to 10 minutes every couple of days to have his coat quickly brushed out than he is to behave for a half-hour or longer while you attempt to pick every dug-in briar he picked up in his coat over the past three months. 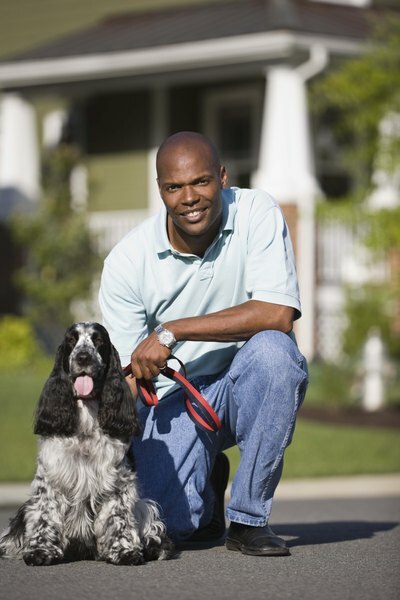 Take your dog on a long walk or to the park for vigorous play on days you are planning on grooming him. Cocker spaniels are energetic and intelligent dogs; they tend to demonstrate behavior problems if they get too little activity. Your dog's squirming when you try to work with him is probably a sign that you need to spend more time with him or enlist the services of a professional dog walker or doggie day care to occupy his mind during the day. A dog that's been active during the day is more likely to stand still when you groom him. Put a grooming loop around your dog's neck or attach him to a professional quality grooming restraint. Keep the grooming loop or restraint attached to your dog throughout the grooming process. A properly used grooming loop or restraint on a dog who's been trained not to pull on a leash will prevent escape and minimize squirming while you are grooming. Brush your dog's coat using a metal comb. If his fur has tangles, pick them out using your fingers while the coat is dry. Wet knots tend to be more difficult to get loose than dry knots are. Cocker spaniels have rapidly growing coats that become matted very quickly if you do not brush your dog regularly. Pay special attention to the hair on your dog's underarms, legs and paws to make sure uncomfortable tangles do not develop and cause skin irritation. Wash your dog in a gentle dog shampoo when he gets significantly dirty or if he hasn't had a bath in a couple of months. Bathing your dog too frequently can cause poor coat condition, as it strips oils from your dog's skin and coat. Cocker spaniels are prone to skin conditions. Bathing your cocker too often can exacerbate skin issues and cause itchiness, dryness and discomfort for your dog. If your dog is difficult to handle, enroll him in obedience school to teach him to respect your authority as well as how to hold still during grooming. If you cannot manage to groom your dog or don't feel up to it, hire a professional to do it for you. Don't ignore it; improper grooming is bad for a dog's health. Attempting to cut or clip a squirmy dog can be dangerous and cause harm to your dog if you are not a professional groomer. Leave haircuts to the professionals. What Kind of Comb for a Cocker Spaniel?